The newest Seahawk took part in his first on-field workout with the team Wednesday. 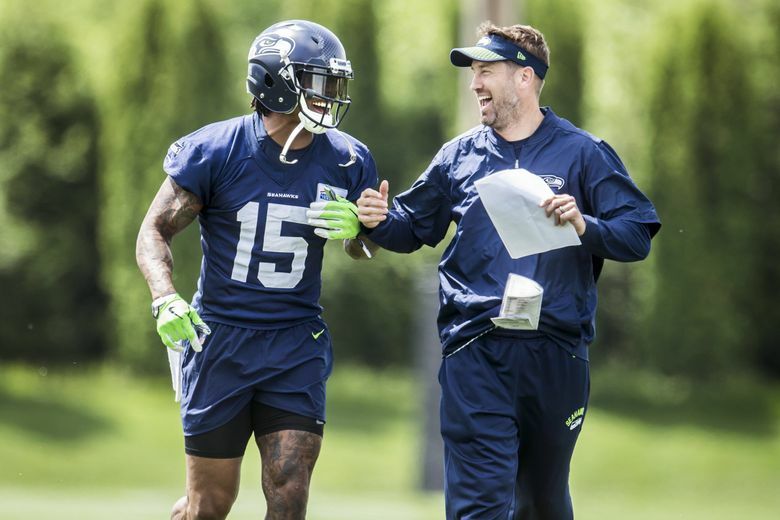 Eight years after he took his first visit to the VMAC to be courted by Pete Carroll and the Seahawks brass, Brandon Marshall finally put on a Seattle jersey and helmet Wednesday. In 2010, when Carroll made attempting to lure Marshall to Seattle as a restricted free agent one of his first tasks as Seahawks coach, Marshall ended up in Miami, instead. “It wasn’t a great fit then,’’ Marshall said. Brandon Marshall talks to Seattle reporters following OTAs Wednesday. But looking out at a sun-drenched field as he talked to the media following Wednesday’s OTA, Marshall said he thinks there’s no better fit for him now than Seattle, where the Seahawks have a noticeable need in their receiving corps for some size (he’s listed at 6-5, 232 pounds) and proven experience (he’s made six Pro Bowls and has eight 1,000-yard receiving seasons in 12 years in the NFL). Here are five thoughts on why Marshall may indeed be a good fit for the Seahawks now, in no particular order. It was known that Marshall had surgery last fall on his left ankle after snapping the deltoid ligament in the fifth game against the Chargers. But Marshall revealed Wednesday that he also had surgery last fall on a toe that had bothered him since the seventh game of the 2015 season when he was with the Jets. Because the toe injury would require surgery that would take “five, six seven months to get back right’’ Marshall said he had decided he wouldn’t bother with it until he had retired. But once he was knocked out early for the season last year, Marshall said decided to also have the toe fixed. Marshall said he is recovered now from both surgeries and has been able to run pain-free for about a month, saying he did so for the first time a few days after being released by the Giants on April 19. Marshall said he still has a ways to go to get back into football shape but thinks that can happen relatively quickly. Marshall was eased into work on Wednesday, running only a few plays during team sessions but will get gradually more action over the next few weeks. While Marshall ranks among the best receivers of his generation, Carroll seemed to go out of his way to temper expectations for Marshall as his Seattle career begins. “We’ve got to get him on the field with our guys and see how it goes,’’ Carroll said. What the Seahawks appear to hope is that Marshall — now 34 — can at least help in classic “big receiver’’ situations, specifically in the red zone. “He’s physical and he works well in close areas,’’ Carroll said. Introductory press conferences tend to be happy, say-everything-right affairs. But Marshall insisted he doesn’t need to be a No. 1 receiver, saying he has always prided himself on working within the offense wherever he has been, and will do the same in Seattle, happy to take on a complementary role if asked. “It’s not about how many balls I catch but how many wins I have at the end of the day,’’ Marshall said. Marshall signed with Seattle roughly three weeks after he took a visit to the VMAC, at which he said his workout was the most important thing, needing to show the Seahawks he was healthy and could still play. While Marshall convinced Seattle to take a shot, he also candidly admitted he had few other options, as his one-year contract and small salary (he was making $6 million a year with the Giants) indicates. That Marshall is one of the most accomplished receivers in NFL history lends to the easy thought that he can help mentor the team’s bevy of young receivers. But Carroll said the Seahawks haven’t told Marshall they expect him to do any leading, another possible tempting of expectations that might also be designed at letting Marshall concentrate on getting into football shape and learning a new system. Marshall’s career has not only been featured lots of receptions and touchdowns but also lots of moves — Seattle is his sixth team — and controversy. Marshall spoke candidly Wednesday about being diagnosed in 2011 with borderline personality disorder, which contributed to what has been reported as at least eight incidents of “violence against women’’ since he entered the NFL in 2006, as Sports Illustrated put it in 2014, though he has never been arrested. Marshall said he got “challenging questions’’ from the Seahawks about his past and said with a laugh that the team’s “screening process is worse than the TSA line’’ at the airport. Coming to Seattle gives him another chance to show illustrate the progress he’s made. Marshall also has been known for having some public run-ins with teammates. One involved running back Matt Forte, who once said that he thought Marshall’s regular in-season appearances on Showtime’s Inside the NFL show while with the Bears in 2014 — which required him to fly to New York — weren’t received well by everyone with the team. The uncertainty of the last few weeks of if and where he’d get another chance may only have increased Marshall’s appreciation for becoming a Seahawk. He happily broke the news of signing with Seattle on Tuesday by posting pictures on his Instagram account of himself in a Seahawks jersey. Wednesday, he said he acquired those on his trip to the VMAC a few weeks ago.